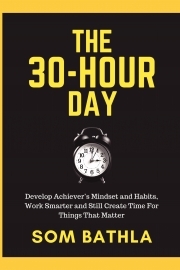 Description of "The 30-Hour Day"
Do you consistently think about how to Increase your Productivity and Perform at your Best? - Do you often struggle to tick off your to-do-list, which appears to be never ending? - Do you often feel stressed out due to the hurricane of workload invading your personal and social life? - Do often think yourself as ‘Slow Performer’ in spite of your best intentions? - Is your next promotion on the job or achieving success in your next project seems a nightmare to you? - Do you miss out important personal and social events due to your work and often feel embarrassed? - Every another message in your mailbox easily gets you distracted from your work or fun activity? - Your best intentions in the morning don’t yield the desired results, Sounds familiar? - Have you ever often failed to instill success habits of the achievers after the initial dose of motivation ends? - Feel more in control of your personal and working life. - Provide easy to follow techniques on how to stop procrastinating and find a permanent cure to procrastination. - Feel like creating few more hours in your day with simple mental tweaks. - Understand how to be fearless in all situations. - Finding ways to cure your fear of failure and fear of rejection. - Creating new healthy and successful mindsets and habits for life. - Re-wiring your brain by creating new neuropathways to think differently and keep moving further without any stress. - You will learn the deeper underlying root causes, which hamper your productivity. - You will realize the importance of your deeper purpose as a force for all your actions. - You will get to know 7 negative mindsets, which have always crippled you from achieving your best life and how to easily replace those with the resourceful mindsets. - You will also learn 25 life changing new success habits in every area of your life to perform at your best. - You will get practical tools to permanently install the new habits for successful life. - How to deal with your reporting manager and with your own mind, if you have missed some deadline for work? - How to keep delivering faster even if the work is not perfect yet. - How you can conquer your mind to focus on your work in spite of alluring distractions. - How you can better deliver any work when it requires the involvement of other colleagues. - How making few minor changes in your daily routine will set the tone of your day towards positivity. - How to improve your emotional intelligence in handling stressful work place environment. This book blends Author’s experience of more than a decade and a half of working in the corporate world involving different work cultures ranging from highly professional system oriented organization to very demanding consultancy related work. During all these years, he has personally experienced the challenges arising on the way towards improving work performance and therefore understands that the stress associated with lack of productivity its impact on overall life. To overcome all these issues, the author has personally implemented these strategies in his practical environment. This productivity book incorporates all his knowledge and experience in a step by step manner with the intention to help the reader perform better and achieve goals faster. Som Bathla loves to explore all the possibility of personal development in all areas of life. He believes that everyone has the potential of achieving more than one thinks about himself. He is a strong believer of the following. Reviews of "The 30-Hour Day"